Get cake estimates for the style and size of cake you want to have. Ask about all the flavors they offer. 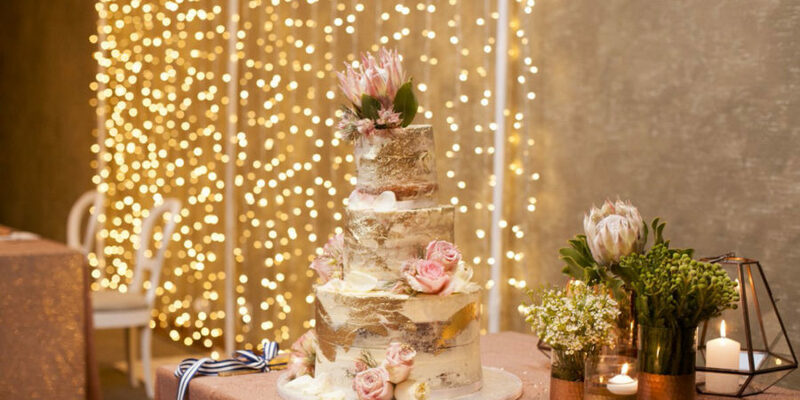 Make sure your cake arrives early at your venue and is placed in a cool and safe place so it does not melt or get knocked. Make sure a specific person is in charge of the delivery and receipt of the cake at the venue so it is looked after and properly placed. Ask if your wedding cake includes fresh flowers or not. Don’t forget to supply the cake knife or get caterers to bring one for the cutting of the cake. Be creative with your cake ideas– consider a Donut cake or Cookie bar as an alternative to the traditional cake. Get a menu and cost suggestions from your caterer. Ask if the cost of food includes crockery, cutlery etc. or if that will be an additional cost. Staff – Ask for these costs upfront. Enquire about the number of staff required and approximate hours you will need. Some clients may do dessert themselves to save on costs. My advice is, where possible, have your caterer handle and be in control of the entire food process. Much less fuss and stress for you in the long run.